Clockwork Removals has a network of 10 accredited branches throughout the UK offering local, national and international removals and storage services. The Scotsman Removals team is here to take the stress out of moving. Whether it’s for your home or business, we can help you plan every aspect from start to finish within your timescales and budget. Handled by our professionally trained and uniformed removers, you can trust that your possessions and equipment are in safe hands, giving you peace of mind. Our modern fleet of vehicles are fully equipped and maintained to take care of your possessions. With state-of-the-art GPS fleet tracking devices located in every vehicle, we can provide you with a fast, efficient yet affordable service. The service we offer is flexible and can be tailored to suit your needs. From dismantling and reassembling furniture to packaging your treasured possessions, experience has taught us how to handle any given situation. Our business is unique as we plan the removal with the customer. We listen to what they need and work out solutions based on that information. Our friendly professional staff will care for all our customers needs. We are proud members of The National Guild For Removers & Storers and also The Removal Ombudsman. 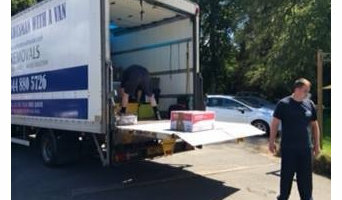 Stirling Van Hire & Removals Offer Professional Low Cost Moving And Relocation Services In And Around The Stirling Area. Man And Van Hire Services Also Available For Single Items And Small Loads. With No Minimum Hire Period & No deposits Required, We Can Help Shift Your Heavy/Bulky Items Locally, Nationally Or Internationally. Service normally within an hour. Why should I hire Glasgow, Glasgow City removal companies? Some house removals will involve total house clearance work – perhaps you’re stripping bare your old place and redoing it before selling it on? Or if you only need a few large items moved, there are lots of removal companies in Glasgow, Glasgow City that will be happy to offer furniture removal, and may even be willing to take items to the tip for you if you’ve decided to get rid of them. If you find a reliable man with a van in Glasgow, Glasgow City, he may be able to accommodate you throughout your whole move – helping you with house clearance, taking items to the tip, to storage containers, to salvage yards and finally helping to move everything into your new place. A Glasgow, Glasgow City man with a van service is often a bit more flexible than a removals company, so consider individual movers as well as large firms when you move. If you’re moving at the same time as carrying out renovations, you may need to liaise with your other contractors as well as Glasgow, Glasgow City removal companies to make sure the move and house clearance can go as seamlessly as possible. Here are some related professionals and vendors to complement the work of removal companies: . Find removal companies on Houzz. Narrow your search in the Professionals section of the website to Glasgow, Glasgow City removal companies and man with a van services. You can also look through Glasgow, Glasgow City photos to find examples of house clearances and moves, then contact the professional who worked on them.